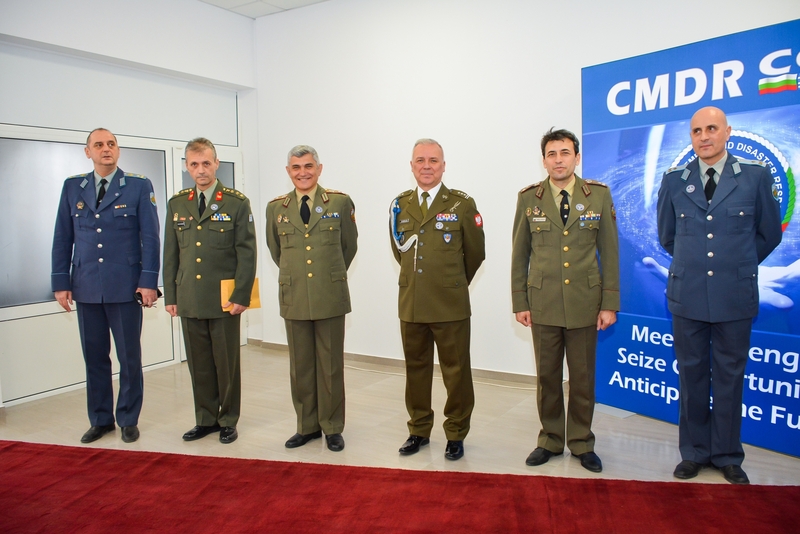 On April 2, 2019, the Crisis Management and Disaster Response Centre of Excellence (CMDR COE) celebrated the fourth anniversary of its formal accreditation as an international military organisation – the first of its kind in the Republic of Bulgaria. “Our main activities are aimed at the interagency interaction as well as cooperation with governmental and non-governmental organizations, academia and the industry for enhancing, while where missing – creating, capabilities for the effective use of expertise in crisis management and disaster response.”, stated the CMDR COE Director Colonel Orlin Nikolov in his address to the ceremony . The reception in the newly opened premises of CMDR COE was honoured by the presence of ambassadors and military attaches of diplomatic missions accredited to the Republic of Bulgaria, commanders of the armed forces, representatives of ministries and departments, academia. The event was attended by Mr. Atanas Zapryanov, Deputy Minister of Defence of the Republic of Bulgaria. In his turn, he pointed that such a centre is a serious asset for improving cooperation inbetween NATO Member States. The process of the CMDR COE establishment started by ratification of the Memorandum of Understanding between the defence ministries of Bulgaria, Greece and Poland and HQ Supreme Allied Commander Transformation (SACT), signed on 28 August 2013 in Norfolk, USA. On 31 March 2015, upon a NAC silence procedure, the Centre received accreditation as the 21st NATO COE and was activated as a NATO Military Body with an international status under Article 14 of the Paris Protocol. The CMDR COE is an accredited, fully operational NATO COE, focusing its work on one of the Alliance’s core tasks – Crisis Management. The Centre’s concept of operations has been crafted as to ensure its complementarity role and to avoid duplications with existing NATO or other COEs’ activities. In support of NATO transformation, Nations create a network of Centres of Excellence (COEs). They are nationally or multinationally managed and funded entities. The COEs provide subject matter expertise in support of capability building, improving interoperability and support of capability development with education and training for NATO and partner leaders and units, testing doctrines, developing and validating concepts through experimentation, providing lessons learned, evaluations and assessments. The purpose is to promote ideas in a way that will advance the common understanding as well as gain points of view that might not have been otherwise considered. The CMDR COE conducted the first NATO Gender Focal Point (GFP) course from 5 to 7 February 2019 in Sofia. By conducting NATO Crisis Response System Course from 29 to 31 January 2019, Sofia, CMDR COE marked its first educational event for the year of 2019. A post-exercise Lessons Identified Conference in regard of command-post and field exercise "SRBIJA 2018". Colonel Roussinov relinquished the position of the CMDR COE Director to Colonel Nikolov who assumed the command. The ceremony was attended by high representatives from the Sponsoring Nations: the Republic of Bulgaria, Hellenic Republic and Republic of Poland as well as distinguished guests from governmental entities and academia. State Secretary of Serbian MoD, Aleksandar Zivkovic opened a four-day training for psychologists from the Ministry of Defense and the Army of Serbia called "Training for the management of stress and resilience" and emphasized that the Ministry of Defense appreciates the work of psychological services in all segments. The CMDR COE conducted its resident, NATO SELECTED, Strategic Decision-Making for Crisis Response Operations (SDMCRO) Course on 26-30 NOV 2018 at Hotel Shipka, Sofia. This year the course methodology was premised on adult learning - a method enabling the active involvement of trainees in the process of learning by encouraging critical thinking, communication, and problem solving based on individual approach and creativity. On Thursday, November 8, Polish Senior National Representative, COL Dariusz Dobron held National Independence Day ceremony which was dedicated to commemorate the anniversary of the restoration of Poland’s sovereignty. Ceremony started with historical outline of the recovery of Polish Independence, followed by reception. The ceremony was honored by the presence of Polish Chargé d′affaires Mr Andrzej Mojkowski, Minister Consul Mr Andrzej Janik, Defense Attaché COL Marek Warmiński and COM NFIU BG COL Stayko Prokopiev. On 24-25 October 2018, the Crisis Management and Disaster Response Centre of Excellence (CMDR COE) hosted an important event – the 6th Steering Committee Meeting. During the meeting on 24 October, the SC members approved the proposed Program of Work 2019 of the Centre as well as the proposed CMDR COE budget estimates for FY-2019. Every year in November the world celebrates the International GIS Day to recognize the power of Geographic information systems for enabling a safer, smarter and more sustainable world. The GIS Day provides an international forum for the users to demonstrate real-world applications that are making a difference in our society. The prestigious event in Bulgaria this year will take place on November 14th, 2018, 9:00 am in Sofia Hotel Balkan. It is organized for 20th consecutive year by ESRI Bulgaria in partnership with more than 30 leading governmental, academic, IT, non-governmental organizations and media. The CMDR COE was pleased to hold a productive joint meeting with a delegation from the Romanian Parliamentary Committee for Defence, Public Order and National Security, headed by the Chairperson - Mr. Dorel-Gheorghe CĂPRAR, and with the Chairperson of the Bulgarian Parliamentary Defence Committee - Mr. Konstantin POPOV, with the participation of the Deputy Minister Of Defence of the Republic of Bulgaria - Mr. Atanas ZAPRYANOV. The 13th NATO Computer Assisted Exercise Forum (NATO CAX Forum 2018) was conducted from 25 to 27 September 2018 in Sofia (BGR), The venue gathered more than 180 participants from 22 countries, 34 organizations and companies and 13 governmental bodies. The successful event has been organized by the NATO Modelling and Simulation Centre of Excellence (NATO M&S COE) in cooperation with the NATO Crisis Management and Disaster Response Centre of Excellence (CMDR COE). The Crisis Management and Disaster Response Centre of Excellence (CMDR COE) is hosting, as well as taking part in the Second Collaborative Resilience Concept Workshop (CoRe WS2) from 10 to 12 September 2018 at Shipka Hotel, Sofia, Bulgaria. The CoRe Concept development is sponsored by NATO Bi-Strategic Command and is run by the Allied Command Transformation. The CMDR COE is honored to be the host of the CoRe WS2 and to play an active role in the conduct of the event. The Crisis Management and Disaster Response Centre of Excellence was honoured to welcome Brigadier General Tudorica PETRACHE, Commander of South-Eastern Europe Brigade (SEEBRIG) on 28 June 2018. The official visit of BG Petrache to CMDR COE was conducted as a productive meeting between the distinguished guest and the CMDR COE Command Group, represented by CMDR COE Director Colonel Vassil Roussinov, Deputy Director Colonel Vasileios Palaiologos and Transformation Branch Chief Colonel Dariusz Dobron. The Crisis Management and Disaster Response Centre of Excellence (CMDR COE) and the Joint Chemical, Biological, Radiological and Nuclear Defence Centre of Excellence (JCBRN Defence COE) signed a Framework Collaboration Agreement on June 5, 2018. CMDR COE conducted the 6th Annual Interagency Interaction in Crisis Management and Disaster Response Conference on June 5-6, 2018. The CMDR Interagency Interaction Conference is an annual event, which was held on June 5-6 in the Central Military Club, in Sofia, Bulgaria. The Conference brought together subject matter experts and various actors working in the crisis management and disaster response domain. The CMDR COE Annual Conference serves as a platform for information and knowledge exchange and facilitates coordination of actions among key stakeholders, both military and civilian, in the CMDR domain. Each year the event addresses specific issues from the latter domain and gathers experts from across NATO Allied and Partner countries. From 28 May to 01 June 2018, CMDR COE successfully conducted the Disaster Management Course. Тhe course provided basic knowledge in regard with disaster management fundamentals, disaster management process and its close relation to risk management process. Additionally the main international actors in disaster response were introduced and discussed. The attendees were introduced to numerous topics related to disaster theoretical foundations, disaster environment, risk management, resilience, humanitarian assistance and the role of key international actors in disaster response through lectures, practical teamwork and subsequent student presentations. The Crisis Management and Disaster Response Centre of Excellence was honoured to welcome Brigadier General Robert A. Huston, Commander, NATO Headquarters Sarajevo, Bosnia and Herzegovina (BIH) on May 14, 2018. The official visit of BG Huston to CMDR COE was conducted as a productive meeting between the distinguished guest and the CMDR COE Command Group, represented by CMDR COE Director Colonel Vassil Roussinov, Deputy Director Colonel Vasileios Palaiologos and Transformation Branch Chief Colonel Dariusz Dobron. Recognizing the increasing role of physical and human induced disasters in contemporary and future security environment, the CMDR COE will conduct Disaster Management Course at the Center’s premises in Sofia, Bulgaria from 28 May to 01 June 2018. The course aim is acquisition of basic knowledge related to disasters as phenomenon, the disaster management process and its close relation to the risk management process, as well as the main players and mechanisms in disaster response. For the first time this year the Conference features three workshops: The George C. Marshall Bulgaria Association and European Centre for Security Studies, Garmisch-Partenkirchen, sponsored Security Capability Development workshop, Modelling and Simulation in Support of CIMIC and CMDR and the CMDR COE-led MSG-147 - "M&S Support for Crisis and Disaster Management Processes and Climate Change Implications". From 08 to 10 May 2018 a Disaster Relief Operations Course was held at South-Eastern Europe Brigade (SEEBRIG) HQ, Larissa, Greece. The aim of the event was acquisition of basic knowledge related to disasters as phenomenon, as well as the main players and mechanisms in disaster relief in order to facilitate the use of SEEBRIG ETF tool in such operations. A CMDR COE Mobile Education and Training Team is currently conducting a Disaster Relief Operations Course in SEEBRIG HQ in Larissa, Greece. The event is based on a Request for Support from SEEBRIG regarding improvement of the common understanding of contemporary disaster environment, and to better use of SEEBRIG Engineer Task Force in Disaster Relief Operation. Within the framework of Bulgarian Presidency of the Council of the European Union, and under the auspices of the European Security and Defence College (ESDC), the Crisis Management and Disaster Response Centre of Excellence (CMDR COE) supported by German Federal Foreign Office, Adelphi, Diplomatic Institute to the Minister of Foreign Affairs of the Republic of Bulgaria and G.S. Rakovski Defence College organized and conducted Climate Change and Security pilot-course, the first training activity on this topic in the ESDC academic list. The CMDR COE marked the third year of its official accreditation as an international military organization with a formal reception, which took place at Lozenets Residence. The event hosted Ambassadors and foreign military attaches; commanders of the armed forces; representatives from various ministries, and from the academia. From 19 to 23 March 2018 the CMDR COE successfully conducted this year’s iteration of Crisis Management and Disaster Response Course. The attendees were acquainted to NATO Crisis Management, NATO Crisis Response System, and its complementary elements - NATO Crisis Response Process, Civil Emergency Planning, and Operations Planning. On 20 Mar 2018 the CMDR COE welcomed its new Transformation Branch Head, Col. Dariusz DOBROŃ, POL A. Col. Dobroń succeeds his fellow countryman – Col. Jaroslaw KUBISZ, who completed his term in July 2017. Col. Dobroń graduated from the Aviation High School as a pilot in 1984. He became an officer in 1988 upon graduating from the Polish Air Defence Military Academy, Missile Engineering Faculty. On 21 February 2018, the CMDR COE was honoured to welcome the European Centre of Excellence for Countering Hybrid Threats Director Dr. Matti Saarelainen. Dr. Saarelainen met with CMDR COE Director and Chiefs of Branches as part of his official visit to the Republic of Bulgaria. The CMDR COE Director Colonel Vassil Roussinov presented the Centre, focusing on its current organisation, projects, developed training and education capabilities and strategic perspectives. The Lessons Identified Conference for the consequence management field exercise “BOSNA I HERCEGOVINA 2017” was officially launched today by Mr. Claudiu Zoicas, team leader at the Euro-Atlantic Disaster Response Coordination Centre (EADRCC) Civil Preparedness Section, by Mr. Samir Huseinbasic,exercise director on behalf of the Ministry of Security of Bosnia and Herzegovina, and by Col Vasileios Palaiologos, CMDR COE Deputy Director. From 24 to 26 January 2018 a NATO Crisis Response System Course for national administration experts was successfully conducted. The course was provided in response to a request for support from the Bulgarian Ministry of Defence. The course aim was acquisition of basic knowledge to NATO Crisis Response System Elements and their effective application at national level. On 25 January 2018, the CMDR COE was honoured to welcome the Chairman of the EU Military Committee, General Mikhail Kostarakos. General Kostarakos met with CMDR COE’s Director and Chiefs of Branches as part of his official visit to the Republic of Bulgaria at the invitation of the Bulgarian Chief of Defense Lieutenant General Andrey Botsev. On 28 November 2017 the CMDR COE was honored to welcome the Secretary of State, Head of Department of Emergency Situations of the Ministry of Internal Affairs of the Republic of Romania Dr. Raed Arafat. The 2017 iteration of Strategic Decision Making for Crisis Response Operations Course was held from 20 November to 24 November in Sofia, Bulgaria. The Crisis Management and Disaster Response Centre of Excellence (CMDR COE) conducted its fifth Steering Committee Meeting on October 25-26, 2017. The annual session was held in Sofia, Bulgaria with the participation of the National Representatives from the MOD of Republic of Bulgaria, as a Framework Nation, the Hellenic National Defence General Staff and the MOD of Republic of Poland, as Sponsoring Nations. In accordance with the CMDR COE Functional memorandum, HQ SACT representatives joined the annual event. Members of the Core Planning Team for the Computer Assisted Exercise (CAX) VIKING 18, led by the Project Manager and Exercise Director MG Anders BRÄNNSTRÖM visited the Crisis Management and Disaster Response Centre of Excellence (CMDR COE) on 19 October 2017. The delegation met with COL Vassil ROUSSINOV, CMDR COE Director, COL Milen MILKOV, Education and Training Branch Chief and LTC Anastasios VASILEIOU - Section Head and Acting Hellenic Armed Forces Seniour National Representative. Present at the event was also a team from Operations and Training Directorate, Bulgarian MOD led by COL Dimcho JECHEV. A Montenegro Ministry of Defence Delegation, led by Mrs. Alma Adrovic, Head of the Public Relations Service, visited the Crisis Management and Disaster Response Centre of Excellence (CMDR COE) on September 27, 2017. The delegation attended a meeting with COL Milen Milkov - Education and Training Branch Chief and LTC Anastasios Vasileiou - Doctrine and Standardisation Section Head. The Crisis Management and Disaster Response Centre of Excellence (CMDR COE) is hosting, as well as taking part in the Protection of Civilians Experiment (PoC EXP) from 18 to 22 September 2017 at Metropolitan Hotel, Sofia, Bulgaria. The PoC Concept development is sponsored by NATO Bi-Strategic Command and is run by the Allied Command Transformation. The CMDR COE is honored to be the host of the PoC EXP and to play an active role in the conduct of the event. The University of Architecture, Civil Engineering, and Geodesy in collaboration with NATO CMDR COE invites all interested specialists to become part of the new MSc Programme and to become qualified experts and consultants in engineering provision of protection against disasters and accidents. CMDR COE carried out its 5th Annual Conference Interagency Interaction in Crisis Management and Disaster Response 2017 on June 1-2 in Sofia, Bulgaria. The conference was held under the patronage of the Deputy Prime Minister for Public Order and Security and the Minister of Defense of the Republic of Bulgaria, Mr. Krasimir Karakachanov. The CMDR Interagency Interaction conference is an annual event which brings together subject matter experts, researchers and educators, planners and developers, advisers and various actors working in the crisis management and disaster response domain in order to promote a lively debate on relevant issues. Within the period of 16-18 May 2017, the Ministry of Defense of the Republic of Bulgaria hosted Main Planning Conference aimed at the organization and arrangement of the exercise implementation phase. The conference was opened by Deputy Minister Atanas Zapryanov. Almost all Alliance’s Nations took part in it and for the first time this year the EU has participated in the exercise format. CMDR COE successfully conducted the 5-day Disaster Management course from 15 to 19 May 2017 providing basic knowledge related to disasters as phenomenon, the disaster management process and its close relation to the risk management process, as well as the main players and mechanisms in disaster response. The attendees were introduced to numerous topics related to disaster management, risk management, capability development, gender perspectives, humanitarian assistance and the role of the international actors in disaster response through lectures, practical teamwork and subsequent student presentations. Transformation Network Branch, Headquarters, Supreme Allied Commander Transformation (HQ SACT), in co-operation with the Crisis Management and Disaster Response Centre of Excellence (CMDR COE), successfully conducted the 3rd NATO Centres of Excellence Financial Controllers (FINCON) Conference – 2017. The event was held in the City of Varna on 15-18 May 2017. The 2017 COEs FINCON Conference was opened by Rear Admiral Mitko Petev, the Commander of Bulgarian Navy, who warmly-welcomed the participants in the maritime capital of Bulgaria and wished them productive deliberations in successfully reaching the objectives of the Conference. The Crisis Management and Disaster Response Centre of Excellence (CMDR COE) is pleased to announce that the 5th Annual Conference “Interagency Interaction in Crisis Management and Disaster Response” will be held in Sofia, Bulgaria, on 1 and 2 June 2017. From 25 to 27 April 2017 a Disaster Relief Operations Course was held at South-Eastern Europe Brigade (SEEBRIG) HQ, Larissa, Greece. The aim of the event was acquisition of basic knowledge related to disasters as phenomenon, as well as the main players and mechanisms in disaster relief in order to facilitate the use of SEEBRIG ETF tool in such operations. Today, 4 April 2017, the Crisis Management and Disaster Response Centre of Excellence (CMDR COE) celebrated the second anniversary of its formal accreditation as an international military organisation – the first of its kind in the Republic of Bulgaria. The celebration was marked by a reception and an official welcome and awarding ceremony, on which, by order of the Minister of Defence of the Republic of Bulgaria, Mr. Stefan Yanev, eight CMDR COE military and civilian staff members were presented with awarding sings and prizes for outstanding performance. The event took place at the Lozenets Residence, and gathered high ranking officials and representatives from governmental and non-governmental organisations from the crisis management and disaster response community. The Crisis Management and Disaster Response Centre of Excellence hosted a Demo-Experiment MSG-147, as part of the M&S Support for Crisis and Disaster Management Processes and Climate Change Implications project. The event took place in Sofia, Bulgaria in the period 20 March – 24 March, 2017. More than 20 representatives of governmental institutions, JFTC, other COEs, academia and the industry took part in the Demo-Experiment MSG-147. The aim of the MSG-147 project is to develop a technical platform capable of supporting and conducting crisis management and disaster response exercises, analysis and preparatory training, that enables prompt, reasonable and effective tests of Crisis/Disaster and Climate Change Implication (CCI) Response plans. The Crisis Management and Disaster Response Course was held from 20 to 24 March 2017 at the CMDR COE. The aim of the course was to provide the attendees with basic knowledge to NATO Crisis Management, NATO Crisis Response System and its complementary elements - NATO Crisis Management Process, Civil Emergency Planning and Operations Planning, as well as Disaster Response main actors. The assigned learning objectives were fully covered which contributed to achieving the course aim. The Bulgarian Red Cross (BRC) President, Hristo Grigorov, and the Crisis Management and Disaster Response Centre of Excellence (CMDR COE) Director, Colonel Vassil Roussinov, signed a framework cooperation agreement aiming to promote, facilitate and strengthen cooperation in the area of education, training, research and development. In the context of this agreement will be launched a number of research projects, education and training programs, joint training activities, participation in workshops, conferences, training and internship programs, exchanges of researchers, teachers and other experts. The Crisis Management and Disaster Response Centre of Excellence (CMDR COE) organized and conducted the NATO Crisis Management Exercise 2017 (CMX17) Final Planning Conference (FPC) from 06 to 10 February 2017 at Boyana Residence, Sofia, Bulgaria. The exercise is sponsored by NATO Secretary General and is jointly run by the International Staff, the International Military Staff and the two NATO Strategic Commands – Allied Command Operations and Allied Command Transformation. The Crisis Management and Disaster Response Centre of Excellence (CMDR COE) together with the Euro-Atlantic Disaster Response Coordination Centre (EADRCC) conducts the “CRNA GORA – 2016” Lessons Identified Conference from 25 to 27 January 2017 at Arena di Serdica Hotel, Sofia, Bulgaria. The EADRCC held a consequence management command-post and field exercise “CRNA GORA 2016” on 31 October – 3 November 2016. The exercise was jointly organized by the EADRCC and the Directorate for Emergency Management of the Ministry of Interior of Montenegro. In concern of the UN Office for Risk Reduction (UNISDR) efforts to promote the latest disaster risk reduction framework adopted in 2015, a UNISDR Training of Trainers Workshop was carried out from 17 to 19 January 2017 in Sofia. The event has been supported by the Directorate General Fire Safety and Civil Protection – Bulgaria and Disaster Preparedness and Prevention Initiative for South Eastern Europe (DPPI SEE) and accommodated by CMDR COE. The five-day iteration of Strategic Decision Making for Crisis Response Operations Course was successfully conducted from 28 November to 2 December 2016 in Sofia, Bulgaria. The Ambassador of the Hellenic Republic to the Republic of Bulgaria H.E. Grigorios Vassiloconstandakis visited the Crisis Management and Disaster Response Centre of Excellence (CMDR COE) on 1 December 2016. He met with CMDR COE Director Colonel Vassil Roussinov, Deputy Director Colonel Panagiotis Aposporis and Branch Chiefs. The Crisis Management and Disaster Response Centre of Excellence (CMDR COE) hosted a top-level visit of the Deputy Supreme Allied Commander Transformation (DSACT) Admiral Manfred Nielson on November 14, 2016. Admiral Nielson attended a meeting with CMDR COE Director Colonel Vassil Roussinov, Deputy Director Colonel Panagiotis Aposporis and Branch Chiefs. On November 10th, 2016, the Crisis Management and Disaster Response Centre of Excellence and the National Defence Academy ‘G. S. Rakovski’ signed a cooperation agreement. Major general Todor Dotchev, Commandant of the National Defence Academy ‘G. S. Rakovski’ opened the ceremony with a short welcome address. He indicated that the National Defence Academy ‘G. S. Rakovski’ had always been actively supporting the establishment of the CMDR COE and the process of its continuous development. An Armenian Ministry of Defence Delegation, led by Mr. Levon Ayvazyan, Director of the Defence Policy Directorate, visited the Crisis Management and Disaster Response Centre of Excellence (CMDR COE) on November 9, 2016. The delegation attended a meeting with CMDR COE Director, Colonel Vassil Roussinov, and Branch Chiefs. A team from Crisis Management and Disaster Response Centre of Excellence took part in the Consequence Management Exercise CRNA GORA 2016. The exercise was conducted by the NATO’s Euro-Atlantic Disaster Response Coordination Centre (EADRCC) and the Ministry of Interior of Montenegro and took place from 31 October to 4 November 2016 in Podgorica. The Crisis Management and Disaster Response Centre of Excellence (CMDR COE) successfully conducted its Steering Committee Meeting for the fourth year. The annual session was held on 25-26 October, 2016 in Sofia, Bulgaria with the participation of the National Representatives from the MOD of Republic of Bulgaria, as a Framework Nation, the Hellenic National Defence General Staff and the MOD of Republic of Poland, as Sponsoring Nations. SHAPE J9 CIMIC Delegation, led by ACOS J9 RADM Denis Bigot, visited the Crisis Management and Disaster Response Centre of Excellence (CMDR COE) on 11 October 2016. The aim of the duty call was acquirement with the specific CMDR COE’s mission, current status, developed capabilities and started projects. They met with Director Colonel Vassil Roussinov, CMDR COE Branch Chiefs and selected experts as presenters. The CMDR COE organized and conducted the first five-day iteration of Crisis Response Operations Planners Professional Development Course from 26 to 30 September 2016 in Sofia, Bulgaria. The event aimed at providing comprehensive knowledge related to NATO Crisis Management, functioning of NATO Crisis Response System with emphasis on NATO Crisis Response Planning at operational level. Crisis Management and Disaster Response Centre of Excellence (CMDR COE) devotes efforts to address the importance of understanding disaster management processes and raise awareness of the latest developments related to Disaster Risk Reduction (DRR) and Climate Change Adaptation (CCA). CMDR COE conducted its fourth annual conference for Crisis Management and Disaster Response Interagency Interaction from 31st May to 02nd June in Marinela Hotel in Sofia, Bulgaria. The Chief of the Hellenic National Defence General Staff Admiral Evangelos Apostolakis visited the Crisis Management and Disaster Response Centre of Excellence (CMDR COE) on 1 June. He met with Director Colonel Vassil Roussinov, the Chief of Staff of the Bulgarian JFC Commodore Dimitar Yordanov, and CMDR COE Branch Chiefs. In the period May 31 to June 3, 2016 CMDR COE will hold two events - ANNUAL CONFERENCE INTERAGENCY INTERACTION IN CRISIS MANAGEMENT AND DISASTER RESPONSE 2016 and MSG-147 - 2ND MEETING. Both events will be broadcasted live on the Web. For those who want to join online, below are the links to the relevant events. CMDR COE held the Disaster Management Course from 16 to 20 May 2016 in Sofia, Bulgaria. The aim of the course involved the acquisition of basic knowledge related to disasters as a phenomenon, the disaster management process and its close relation to the risk management process, as well as the main players and mechanisms in disaster response. The South-Eastern Europe Brigade (SEEBRIG) was established in 1999 and is currently located in Larissa. The SEEBRIG consists of six NATO and Partnership for Peace (PfP) nations: Albania, Bulgaria, FYROM, Greece, Romania, and Turkey and has a purpose to promote regional stability and security in South-Eastern Europe. A Mobile Education and Training Team (METT), comprised of CMDR Subject Matter Experts (SMEs), conducted from 11 to 13 April 2016 a Disaster Response Operations Course at South-Eastern Europe Brigade (SEEBRIG) HQ, Larissa, Greece. Thirty five participants from SEEBRIG HQ – representatives from Albania, Bulgaria, the former Yugoslav Republic of Macedonia, Greece, Romania, and Turkey took part and successfully completed the course. One year after the decision of the North Atlantic Council (NAC) for the accreditation of the Crisis Management and Disaster Response Centre of Excellence, the Centre celebrates its activation as a NATO Military Body. The Crisis Management and Disaster Response Course took place from 21 to 25 March 2016 at the CMDR COE. The aim of the course is to provide the attendees with basic knowledge to NATO Crisis Management fundamentals, NATO Crisis Response System, and its complementary elements - NATO Crisis Management Process, Civil Emergency Planning, and Operations Planning, as well as Disaster Response main actors. Headquarters, Supreme Allied Commander Transformation (HQ SACT) in cooperation with the Crisis Management and Disaster Response Centre of Excellence (CMDR COE), successfully conducted the 2016 COE Legal Advisors (LEGADs) Conference in Sofia on 24-25 February 2016. Ministry of Interior, supported by Civil-Emergency Planning Representative at Permanent Delegation of the Republic of Bulgaria to NATO, organized and conducted from 17 to 18 February 2016 CEP Workshop: Towards Operational, Coherent and Effective Civil Crisis Response Measures. The Euro-Atlantic Disaster Response Coordination Centre (EADRCC) in cooperation with the Crisis Management and Disaster Response Centre of Excellence (CMDR COE) conducted a Lessons Identified Conference for the EADRCC Exercise Ukraine 2015 in Sofia on 25-27 January, 2016. You are cordially invited to attend and participate in the Kick - Off meeting of the NATO M&S Group 147 “M&S Support for Crisis and Disaster Management processes, and Climate Change implications”. This event will take place on 17th and 18th March 2016 at the Arena Di Serdica Hotel in Sofia (Bulgaria). CMDR COE would like to share with counterparts, collaborators and the whole crisis management and disaster response community of interest its first good news for the New 2016. The Training Requirements Analysis (TRA) workshop for the discipline Military role and tasks in Crisis Management/Disaster Relief was held on 13-14 January 2016 in Shipka Hotel in Sofia, Bulgaria. The workshop was attended by more than 20 participants from eight EU countries (AUT, BEL, GER, BUL, FIN, CYP, POL, ROM) and EU Military Training Group (EUMTG). The Working Group comprised experts from the Bulgarian National Defense College, other COEs, Defense Ministries and EU institutions. CMDR COE has executed successfully from 1 to 3 December 2015, for the second consecutive time a course with the aim of providing Strategic Decision Makers with comprehensive knowledge of NATO Crisis Response Operations Planning. CMDR COE successfully conducted the first Disaster Management Course from 17th to 19th November 2015. During the 3-day course participants acquired basic knowledge related to disasters as a phenomenon, the disaster management process and its close relation to the risk management process, as well as the main players and mechanisms in disaster response. CMDR COE successfully conducted for the second consecutive time the Crisis Response Operations Planners Professional Development Course from 20th to 22nd October 2015. The aim of the course was directed at acquisition of comprehensive knowledge related to Crisis Management in NATO, functioning of NATO Crisis Response System with emphasis on NATO Crisis Response Planning at operational level. On October 14-15, 2015, the Crisis Management and Disaster Response Centre of Excellence (CMDR COE) hosted its Steering Committee Meeting for the third year. The annual sessions are the venue where the Framework Nation and Sponsoring Nations set out all required prerequisites to be provided by the CMDR COE every year. The Sofia Military Attaché Corps has paid a visit to the Crisis Management and Disaster Response COE. The attaches were familiarized with the ongoing projects objectives of the Centre and met with its staff members. Col Roussinov, CMDR COE Director presented the main activities and focused attention to their significant contribution to the enhancing of nationwide capabilities for crisis management and disaster response. The CMDR COE has carried out its third annual Interagency Interaction Seminar at Boyana Residence, Sofia, Bulgaria in the period 8-9 JUN 2015. The keynote speakers of the seminar were Mr. Dimitar Kyumyurdzhiev – Deputy Minister of Defence, Mr. Guenter Bretschneider - Head of the CEPOS, IS, NATO HQ, RADM Chris Sadler - Reserve Deputy Director, Maritime Operations U.S. Fleet Forces Command and Col Vassil ROUSSINOV – CMDR COE Director. The CMDR COE is pleased to announce the launch of its third Interagency Interaction Seminar combined with the Urbanisation Experiment Final Coordination Conference (FCC) and Experiment Control Training Session. The two major events are scheduled to take place at Boyana Residence, Sofia, Bulgaria in the period 8-12 JUN 2015. The Interagency Interaction Seminar will be held over the course of two days - 8-9 JUN, 2015. CMDR COE hosted Partnership Realtime Information, Management and Exchange System (ePRIME) Training Course. On May 27th 2015 the Bulgarian Deputy Defence Minister, Mr. Dimitar Kyumyurdzhiev formally opened the Partnership Real time Information, Management and Exchange system (ePRIME) training course. This event is organized by the Cooperation and Regional Security Division, NATO HQ International Military Staff, led by Rear Admiral Emil Eftimov. This course is hosted by the Crisis Management and Disaster Response Center of Excellence (CMDR COE). The Crisis Management and Disaster Response Course was successfully conducted from 19 to 21 MAY 2015 by CMDR COE. The aim of the course was to provide the attendees with theoretical foundations of NATO Structure and Crisis Management. In addition, the teamworks allowed the participants to apply the theoretical knowledge into practice interacting with respective NATO entities. CMDR COE is pleased to announce that its third annual seminar for Crisis Management and Disaster Response Interagency Interaction will be held at the Boyana Residency, Sofia from Monday 8th June to Tuesday 09th June 2015. Three ideas underlie this year seminar as clustered in the shape of three plenary sessions. The Crisis Management and Disaster Response Centre of Excellence (CMDR COE) is delighted to announce that the on 31st March the silence procedure by NAC has ended and the Centre has earned status as the 21st NATO COE and its activation as a NATO Military Body with a granted international status under Article 14 of the Paris Protocol, as recommended by HQ SACT. After successful conduction of the seminar "Visualizing Implication of Climate Change on Military Activities and Relationships" in 2013, its successor "Building Resiliency and Decreasing Vulnerability through Climate Change Adaptation" was unveiled on 30 March 2015. Commodore Mihaylov, director of the Operations and Training Directorate - Bulgarian MOD, formally opened the seminar in Triaditza Hall at Grand Hotel Sofia. The event brings together flag-level representatives of governmental bodies from several NATO countries and 4 PfP nations. It is hosted again by CMDR COE and organized in partnership with the U.S. European Command. The aim of this hybrid training event is to enhance Balkan States′ capabilities to respond to a regional crisis while testing and improving interoperability of their Modeling and Simulation capabilities. The IPC organized by Joint Force Command, was held in Charalitsa on 18 and 19 of March 2015. Participants from Ankara, Athens, Belgrade, Bucharest, Podgorica, Sarajevo, Skopje, Sofia, Tirana and NATO – JFTC took part in the meeting. The busy schedule of the event included brief and discussions on the EXPLAN, Geo-strategic situation and initial assessment. Fruitful syndicate work with important deliverables for the exercise development process were held. The Crisis Management and Disaster Response Centre of Excellence (CMDR COE) successfully conducted the pilot Higher Command Crisis Response Operations Course from 24th to 26th of February 2015. The aim of the course was to introduce the attendees to the competences and tools, enabling successful application of solutions in response to crisis in national or international environment. The objectives were fully covered over the course of three days which resulted in common understanding on NATO Crisis Management and Political-Military relations and armed the participants with proper tools for management of main activities connected to Political-Military Estimate at Strategic Level. On Dec 16th, 2014, the Bulgarian Deputy Defence Minister, Mr. Dimitar Kyumyurdzhiev formally opened the Final Adaptation Planning Conference (FAPC) for the Crisis Management Exercise (CMX) 2015. Involving 153 participants from NATO states plus Australia, Japan and Ukraine it had the aim to finalize and adapt the training efforts in order to carry out successfully the upcoming CMX 2015 as effectively and efficiently as possible. "We, representatives of all member states, must be responsible for ensuring that we have in place crisis management and organization capable for managing any unexpected situation. We have to maintain and further develop our capabilities as to fulfill the expectation that the public has entrusted us", pointed Mr. Kyumyurdzhiev in his opening speech. The Crisis Management and Disaster Response Centre of Excellence (CMDR COE) successfully conducted the pilot Crisis Response Operations Planners Professional Development Course from 26th to 28th November 2014. Numerous experts attended the course including representatives from the Bulgarian Ministry of Defence, JFC, Army, Chief Directorate Fire Safety and Civil Protection under the Ministry of Interior, Bulgarian Red Cross, as well as representatives from the Defence Administration Office and the Ministry of Human Resources of Hungary, and the CCD COE, Estonia. On 24-25 November 2014, the Crisis Management and Disaster Response Centre of Excellence (CMDR COE) hosted two important events – the 2nd Steering Committee Meeting and the Accreditation Visit from HQ SACT. During the Steering Committee meeting on 24 November, the SC members approved the proposed Program of Work 2015 of the Centre as well as the proposed CMDR COE budget estimates for FY-2015. On 22 October 2014, the Deputy Chief of Defence, Major General Konstantin Popov opened the Flag-level Strategic Communications Course. Organized by the Ministry of Defence of the Republic of Bulgaria and CMDR COE in partnership with HQ SACT and STRATCOM COE, the course brings together flag-level representatives of governmental bodies from 11 countries - with the goal to enhance the common understanding in the field of Public Diplomacy, Public Affairs, Information Operations and Psychological Operations. CMDR COE is pleased to announce that COL Jarosław KUBISZ is joining the Centre to run our Transformation Branch activities. COL Jarosław KUBISZ representing the Polish Armed Forces (PAF). He finished officers′ military school in 1994, and Academy of National Defence in 2002. Last time he served inter alia in Operational Directorate of the General Staff of the PAF and Crisis Management Centre of the Ministry of National Defence. In both mentioned above institutions he has dealing with crisis management matters in PAF and NATO as well. Crisis management is one of the fundamental security tasks of the Alliance along with collective defense and cooperative security. Depending on the nature of the crisis, different types of crisis management operations may be required. The good operations planning process understanding is essential for all NATO Planners. In line with this, Crisis Management and Disaster Response Centre of Excellence (CMDR COE) developed and will run pilot Crisis Response Operations Planners Professional Development Course from 26th to 28th November 2014. The course will be held in English at Shipka hotel, Sofia, Bulgaria. "We have to learn to counter effectively to the new hybrid type of crisis and disasters, destabilizations and confrontations. And this Centre is a way ahead", stated the Bulgarian president Mr. Rosen Plevneliev in his address to the Opening ceremony of the Crisis Management and Disaster Response Centre of Excellence (CMDR COE) as an International Organization. The ceremony was with the presence of ambassadors and military attaches of diplomatic missions accredited to the Republic of Bulgaria, commanders of the armed forces, and representatives of other ministries and departments. The Crisis Management and Disaster Response Centre of Excellence (CMDR COE) welcomed Major General Terry M. Haston, the Adjutant General Tennessee National Guard for an official visit on August 7th, 2014. During his visit, Maj. General Haston had an office call with the CMDR COE Director, Col. Vassil Roussinov. The meeting was attended by Maj Hancock, bilateral affairs officer, Office for Defense Cooperation of US Embassy and CMDR COE branch chiefs, Col Nikolay Nikolov and LtC Dimitar Dimitrov. CMDR COE has successfully hosted its 2nd Annual Seminar, which is designed to facilitate meeting of experts and sharing of experience among bodies dealing with crisis and disaster response. The event took place from 1st to 3rd July, 2014 in Sofia. Interagency interaction in crisis management and disaster response was the main topic of the seminar. "...If we are united and share our common experiences we will be ready to tackle the different and sometimes unexpected crises and disasters. Crucial for this is the interagency cooperation..." pointed out Rear Admiral Petev in his opening speech. CMDR COE delegation was in Nashville, Tennessee to attend the four-day 2014 CAPSTONE exercise (16-19 June 14) led by the Tennessee Emergency Management Agency (TEMA). The purpose of this visit was to make acquaintance with the TEMA procedures and practices of designing and conducting disaster response exercises. The current one was on a scenario of an earthquake with magnitude 7.7 resulting into severe impacts in 8 states. During the exercise were briefings and presentations concerning the organization and responsibilities of the state′s entities in response of a disaster. CMDR COE team held meetings with representatives from the private sector and Red Cross & Red Crescent who present their engagements in case of emergencies. The CMDR COE delegation was well received by MGen Terry M. Haston, commissioner of the Tennessee Department of Military as he praised the successful partnership between CMDR COE and the State of Tennessee. He also highlighted ideas for further cooperation as more significant contributions by civilian organizations from NATO countries. The CMDR COE has received a formal letter of appreciation on behalf of the Croatian Armed Forces General Staff. It recognizes the great efforts CMDR COE Mobile Training Team has done to conduct courses in regard of the of exercise SEESIM 14 preparation process. Expressing special thanks, the Croatian site states the desire to develop cooperation in future. On 28-30 April 2014, the Crisis Management and Disaster Response Centre of Excellence (CMDR COE) hosted the workshop Military Medical Response in Disaster Management, sponsored by US European Command (USEUCOM) and the Bulgarian Ministry of Defence. The 3-day workshop focused on topics related to principles and practices of medical and psychological support in military missions as well as in operations in response of disasters. The workshop was attended by more than 25 participants from the Bulgarian Military Medical Academy, Joint Force Command, Land Forces, Air Force, medical experts from the services HQs, and Bulgarian Red Cross. Informative presentations delivered by instructors of 212-th Combat Support Hospital and Military Medical Academy and fruitful discussions during each session treated of important issues like framework of disaster planning process, components of basic and contingency plans, psychological aspects of disaster reaction and preventive medicine. The Exercise Planners′ Training Course was conducted by the Crisis Management and Disaster Response Centre of Excellence (CMDR COE) National Defense Academy Mobile Training Team (MTT) in conjunction with the SEESIM 14 Main Planning Conference (MPC) in the Croatian Defense Academy in Zagreb from 31 March to 1 April 2014. The course was designed to enhance the theoretical knowledge and practical skills of NATO and Partners′ Exercise Planners. The course was attended by 46 participants from Albania, Bosnia and Herzegovina, Bulgaria, Croatia, Georgia, Romania, Montenegro, the Former Yugoslav Republic of Macedonia, USA, Greece, and SEEBRIG. The participants were familiarized by members of the MTT with NATO and EU approaches in crisis management and disaster response as well the main exercise planning documents and stages. Presentations "Introduction to Exercise Planning Process", "NATO and EU Crisis Management Systems and Mechanisms", "Main Stages in NATO Exercise Planning Process", "Computer Assisted Exercises and Simulations", and "NATO Crisis Management and Operations Planning" was included in the main part of the course. U.S. Ambassador to Bulgaria, Marcie B. Ries paid a special visit to the Host Nation Coordination Cell (HNCC) a component of Saber Guardian 2014 co-hosted by the CMDR COE. The Ambassador took part in a VTC with the 7th Civil Support Commander at Novo Selo Training Area and expressed an active interest in matters of the exercise. The Ambassador familiarized with the objectives and goals of Saber Guardian 14 provided realism to the exercise execution. The CMDR COE then hosted the Ambassador at their headquarters where she met with the CMDR Staff. U.S. Army Europe (US EUCOM) and the Bulgarian Land Forces Soldiers kicked off Saber Guardian 2014 on Mar 31, 2014. Saber Guardian 2014 is a multinational training exercise designed to reinforce U.S. Army Europe′s commitment to increasing regional flexibility, preserving and enhancing NATO interoperability, and facilitating multinational training. USAREUR Deputy Commanding General, Maj. Gen. Richard Longo, and Deputy Commander of the Bulgarian Land Forces, Brig. Gen. Krasimir Kanev, will serve as this year′s exercise co-directors. A welcoming speech of the Ambassador of the Federal Republic of Germany, His Excellency Matthias Hoepfner has opened the Civil-Military Interaction: Disaster Preparation and Response Workshop, which is taking place in Sofia, 11-13 February 2014. The event is under the patronage of George C. Marshall European Center for Security Studies and co-hosted with the Crisis Management and Disaster Response Centre of Excellence (CMDR COE). The workshop is attended by representatives from civilian and military structures from 11 countries – Albania, Bosnia and Herzegovina, Bulgaria, Germany, Greece , FYROM, Kosovo, Romania , Croatia, Montenegro and USA. In addition on the American side taking part are delegations from the National Guard of the states of Vermont, Maine, Maryland, Minnesota, New Jersey and Tennessee as part of the State Partnership Program. The Final Planning Conference of the exercise Saber Guardian 14 was held in Sofia last week (3-7 Feb 2014). The CMDR COE experts headed by LtC Orlin Nikolov, head of Capabilities Branch, participated in the workshops of the Contingency Management Planning/Unified Action (CPM/UA) syndicate. On February 5, 2015, the CPM/UA members met with representatives of several GOs and NGOs. The meeting was arranged by the CMDR COE and co-hosted with the J9 USEUCOM as there were entities as Bulgarian Ministry of Interior, Chief Directorate Fire Safety and Civil Protection, State Agency of National Security, State Agency for Refugees, Bulgarian Academy of Science, Military Medical Academy, Red Cross, Caritas Bulgaria, Gender Research Foundation, Tennessee National Guard, Bulgarian Modeling and Simulation Association (BULSIM). The purpose of the meeting was to present them the scenario and storyline of their engagement into the exercise. The initial planning conference for the distributed computer assisted exercise South Eastern Europe Simulation Network (SEESIM 14) was held in Zagreb, Croatia. The Republic of Bulgaria is co-organizer and participates actively in the conducting of the exercise together with the Host Nation. Among the participants are also representatives of Albania, Bosnia and Herzegovina, Georgia, Montenegro, Romania, the Former Yugoslav Republic of Macedonia, United States of America and the SEEBRIG. The exercise is held under the auspices of the Ministers of Defence of the SEE Nations. In 3-7 of February experts from the CMDR COE team will take part in the Final Planning Conference of the SABER GUARDIAN ′14 Exercise, organized by the US EUCOM and BGR LANDFORCE. The purpose of the exercise is to train and educate civilian and military participants in planning and conducting an UN mandated Chapter VII Peace Operation/Crisis Response Operation, based on a Comprehensive Approach, and focusing on co-operation and co-ordination within an unstable environment, involving all stakeholders. The principal exercise focus is the civilian-military cooperation and coordination. The scenario supports exercising a wide range of peace operations functions (e.g. rule of law, humanitarian, etc.). The CMDR COE will contribute to achieving the exercise objectives by providing subject matter expert support in the CMDR area and by organizing distributed point for White cell. In 11-13 February 2014 the Civil-Military Interaction: Disaster Preparedness and Response Workshop will take place in Sofia. The workshop is sponsored by the George C. Marshall European Center for Security Studies, the Ministry of Defence of the Republic of Bulgaria and the CMDR COE. The workshop comprises lectures dedicated to NATO and EU Crisis Management, role of military in civil security, risk management, as well as discussions and tabletop exercise. The CMDR COE organised an internal seminar which was held on 20.12.2013. The main focus of the seminar was the crisis in Syria. The CMDR COE experts discussed issued related to the chronology of the crisis; the increased influx of refugees to neighbouring countries and Bulgaria; the positions of NATO, the UN and EU; the involvement of international humanitarian organisations etc. On 11-12 December 2013, the Crisis Management and Disaster Response Centre of Excellence (CMDR COE) co-hosted together with US European Command (USEUCOM) and the US embassy in Bulgaria the workshop Visualizing Implications of Climate Change on Military Activities and Relationships. The opening remarks were given by the Deputy Minister of Defence of Bulgaria, Mr. Ivan Ivanov, who welcomed the participants and underlined the importance of the topics that the workshop focused on.